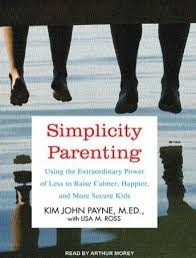 If you are tired, bone tired of the pressures that come with modern day parenting, this is the read for you. The book revolutionized the discussions in my parent education classroom about what kids need, really need, especially in play. If you are not lucky enough to be in a parent education classroom, this would be a great read for a book club full of concerned parents interested in reclaiming a simpler childhood for their kids. If you are tired, bone tired of the pressures that come with modern day parenting, this is the read for you. Here it is, the trusted book that traveled from my personal library, to my professional library, and back to my personal library. I simply do not know how parents parent, or teachers teach without it. This book is a resource for parents that supports you in making choices about your family based on what feels right for you. If I have a question about children, here is where I start. Here it is, the trusted book that traveled from my personal library, to my professional library, and back to my personal library. I simply do not know how parents parent, or teachers teach without it.